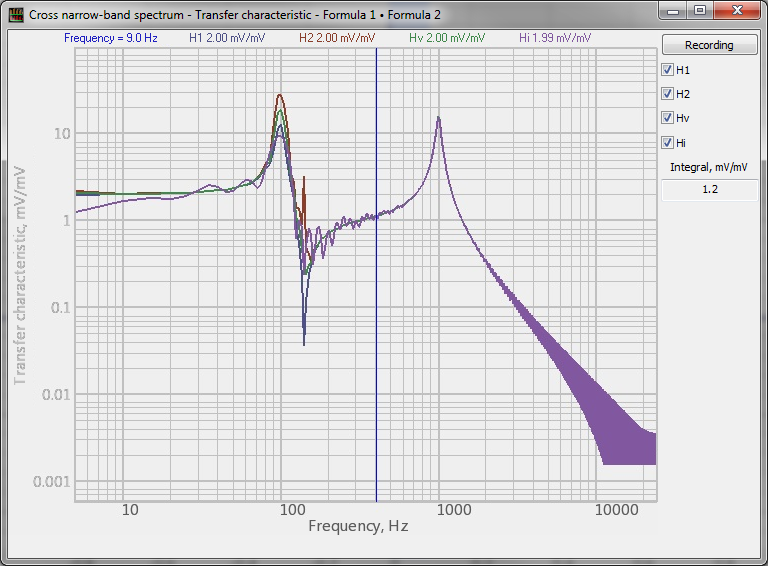 Transfer characteristic is one of the additional functions available in the program Cross narrowband spectrum and used for evaluation of system’s frequency characteristic. With the use of frequency characteristic H(f) it is possible to describe dynamic properties of the system since the system is represented by Fast Fourier transform of the transient function pulse characteristic. In the case of a linear system with constant parameters, the frequency characteristic H(f) depends only on frequency parameter and has no dependence on time parameter or type of the input signal. 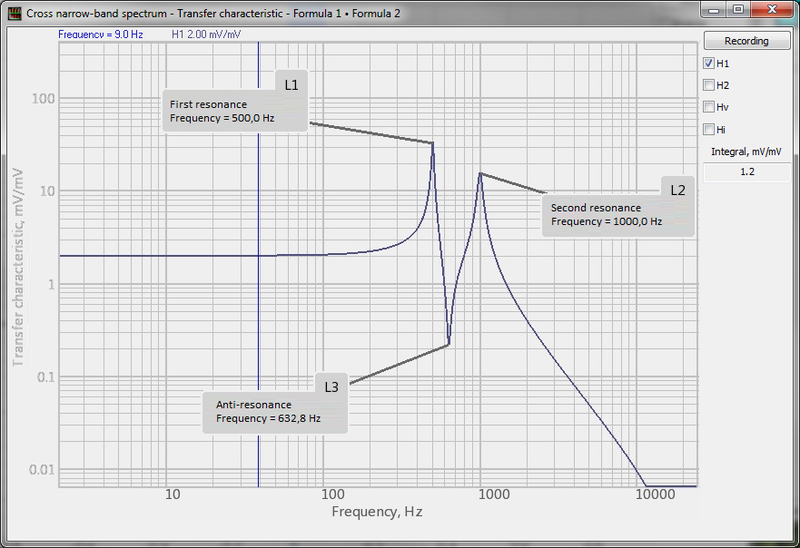 In the case of a non-linear system, the frequency characteristic H(f) may depend on the input channel of the system. If the system parameters are not stable, then the frequency characteristic H(f) depends on time parameter. In order to enable the dialog window of the program “Transfer characteristic“, enter the parameters configuration menu of the Cross narrowband spectrum program by clicking the “Options” key. 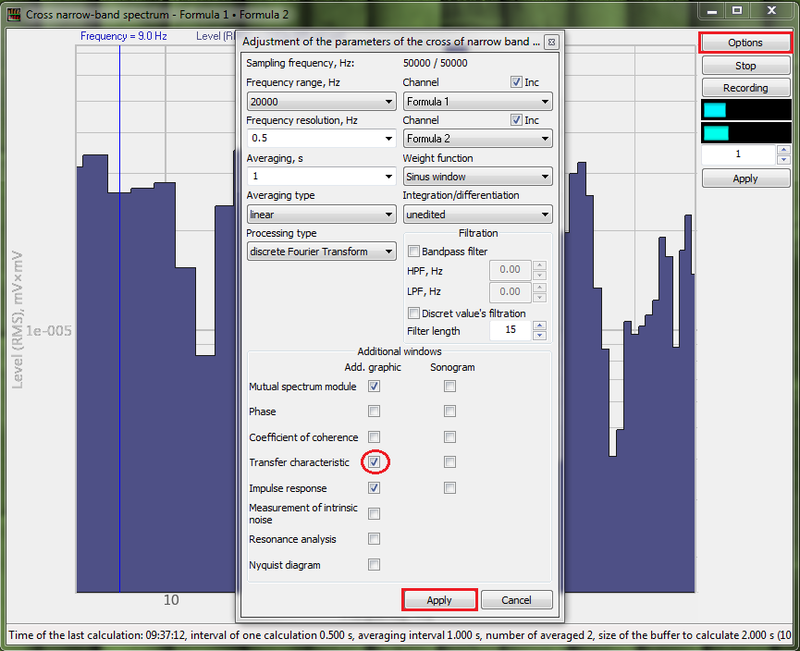 In order to create additional graph displaying the transient characteristic, enable the option “Transfer characteristic” in the “Additional windows” section (see the column “Add. graphic“). As the required parameters are set, click “Apply” key – you will see a new dialog window of the program. H1 – statistical estimate of system’s frequency response based on the assumption that there is no external noises affecting the input signal. The statistical evaluation H1 represents the least quadratic estimate of the system H(f). The statistical estimate H1 is always biased due to limited frequency resolution value. H2 is the statistical estimate of the system frequency response based on the assumption of noise presence in the input signal. Just like in the case of H1 statistical estimate, in the case of noise presence at the output of the signal, the statistical estimate H2 represents the quadratic estimate of the parameter H(f). The bias, in this case, will also be present due to the limited frequency resolution range. Hν is the statistical estimate of system frequency response in general cases (when the external noise is present both in input and output signals). The statistical estimate Hν implies that the external noise sources are incoherent with actual input and output channels. Hi is the Fourier transform of the pulse characteristics. The software programs used for evaluation of frequency characteristics have been developed based on scientific research of Anders Brandt described in the book «Noise and Vibration Analysis: Signal Analysis and Experimental Procedures», Anders Brandt, ISBN 978-0-470-74644-8. The graph can be saved in*.dtx format using the “Recording” key in the top right section of the program window.